Today I wanted to feature a stamp set that I think is slightly over looked at present. It always happens, when a new catalogue comes out, everyone starts focusing on the new products in the catalogue. I am mostly guilty of doing that too. But today I thought I would use a set that carried over into the catalogue. These are the cards that the ladies did in a class on Saturday at my house. I love the big bold flowers in this set. And for some reason I think bright colours. I must challenge myself and make a card using these and pastel colours...mmm...stay tuned. The classes I do at home I tend to make more challenging than the classes I do at the community centres. In line with that, I chose to do a step card as one for the class on Saturday. It looks way harder than it actually is to make. Here are the instructions for how to make it. Place this card in your Simply Scored with the 11 ¾” edge running across the top edge of the scorer. Take the first piece you scored and fold the score lines. The 5 ½” score line folds as a valley fold. The 7 ½” score line folds as a mountain fold. The 9 ½” score line folds as a valley fold. 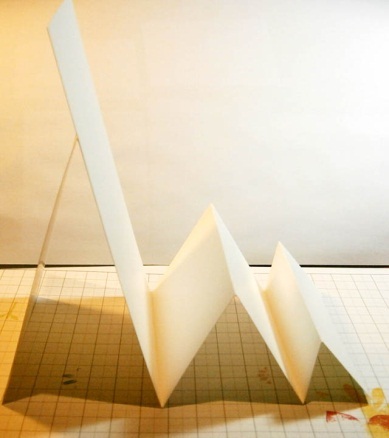 The 10 ½” score line folds as a mountain fold. 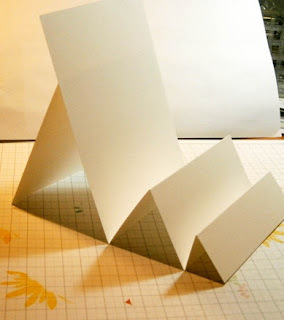 Fold the other piece of scored card in half and attach to the back of the large section. I hope I have given you some inspiration today to get inky soon.